What Popular Fast Food Item was Invented In Western New York? You are here: Home / Western New York State of Mind / What Popular Fast Food Item was Invented In Western New York? Here’s a quick question: What popular fast food was invented right here in Western New York? Think you know the answer? I’ll give you a hint – it’s not chicken wings. OK, smarty-pants, with apologies to Frank and Teresa, “chicken wings” is a correct answer, but too obvious and not the correct answer. I’ll give you another hint – it was invented at the Erie County Fair in the mid-1880’s. If you know Western New York, then you may think you already know the answer. If you’re not sure, you’ll have to read on. On Friday afternoon, I had the pleasure of making my annual visit to “America’s Fair” – the Erie County Fair in Hamburg, New York. I can tell you stories about the Fair dating from my youthful days when I helped my grandparents hawk slices from the family’s pizza stand, but I’ll save that for later. Suffice it to say, all I ever needed to know in life I learned while working in my grandfather’s pizza stand at the Hamburg Fair. But I heard something for the first time this year that made me smile. I heard an ad for the Erie County Fair on a Rochester radio station – two different stations, in fact. It makes sense. The Erie County Fair rivals the New York State fair in size, scope and sensation. It regularly attracts top-line entertainment and hosts nearly a million people every year. That’s almost two times bigger than the Buffalo-Niagara metropolitan area! All those people have to be coming from somewhere, and the surrounding counties (and portions of Canada) seem likely candidates. So, it’s about time the Erie County Fair has adopted the same regional marketing strategy that has proven so successful for the Buffalo Bills, the Buffalo Sabres and Rochester’s Strong National Museum of Play. The Greater Western New York Region represents a very fertile footprint for organizations, businesses and even ideas seeking to promote themselves to a broad range of markets. The Erie County Fair and the Strong Museum stand as hidden gems in the Greater Western New York region. Do you have your own favorite hidden gems? It could be a blog, a destination, an informative web-site or a piece of interesting history. Whatever it is, I encourage you to send us a tip using the form on this site: GreaterWesternNewYork.com – a new web-site I’m starting with the encouragement of quite a few Western New York boosters. We’re in the process of collecting the best resources on the web, and we’re looking for your suggestions! GreaterWesternNewYork.com will contain curated content, meaning we’re looking for the BEST. No matter what kind of person you are – the sports fanatic, the outdoors person, the young family, the foodie, the history buff, etc – we’ll share the best of what’s offered in Greater Western New York to the entire region (and beyond). That’s right – it’s the hamburger – the staple of fast food franchises everywhere. I stumbled on this fact while researching a paper on the history of Buffalo as a senior at Yale University. I rummaged through the multi-storied library stacks looking for source documents when I uncovered a still intact copy of a special edition of the Buffalo Express. (Does the name sound familiar? This paper merged with the Buffalo Courier to form the Courier Express in 1926.) The copy I found was printed sometime in the 1880s (I can’t recall the exact date) and featured the Erie County Fair. One of the articles mentioned the popular “hamburger” sandwich – named for Hamburg, NY, the site of the Fair – was first invented at the Fair a few years earlier. The family of Frank and Charles Menches from Akron, Ohio, claim the brothers invented the hamburger while traveling in a 100-man traveling concession circuit at events (fairs, race meetings, and farmers’ picnics) in the Midwest in the early 1880s. 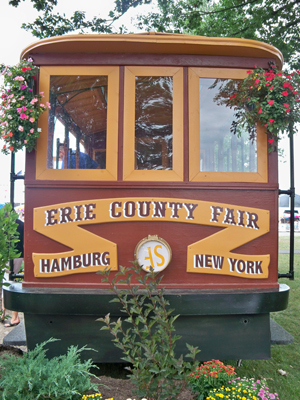 During a stop at the Erie County Fair in Hamburg, New York, the brothers ran out of pork for their hot sausage patty sandwiches. Because this happened on a particularly hot day, the local butchers stop slaughtering pigs. The butcher suggested that they substitute beef for the pork. The brothers ground up the beef, mixed it with some brown sugar, coffee, and other spices and served it as a sandwich between two pieces of bread. They called this sandwich the “hamburger” after Hamburg, New York where the fair was being held. According to family legend, Frank didn’t really know what to call it, so he looked up and saw the banner for the Hamburg fair and said, “This is the hamburger.” In Frank’s 1951 obituary in The Los Angeles Times, he is acknowledged him as the “inventor” of the hamburger. Hamburg held its first Burgerfest in 1985 to mark the 100th anniversary of the birth of the hamburger after organizers discovered a history book detailing the burger’s origins. Thus the All-American Hamburger – a hidden gem from Western New York – was first concocted at another hidden gem from Western New York – the All-American Erie County Fair, or, as us natives like to call it, the Hamburg Fair. Incidentally, the copy of the Buffalo Express I discovered in the stacks of Sterling Library apparently was also a hidden gem. When I returned it, the librarian asked me – in a rather accusing tone – how I managed to take it out of the hallowed halls in which it was housed? I told her the truth. She then told me it belonged in the rare books library. I guess this means I’m probably the last person to have read it. The greater Western New York region is rife with hidden gems like the invention of the hamburger. Would you like to share those that you know? Please consider entering them in GreaterWesternNewYork.com. If you like this story, you’ll love Chris Carosa’s book 50 Hidden Gems of Greater Western New York. Be sure to check out the book trailer on 50HiddenGems.com and sign up for theGreaterWesternNewYork.com newsletter so you can be the first on your street to find out about the next exciting way to help promote your favorite region in America! There are several claims regarding the birth of America’s favorite sandwich. You are leaving out Jello, invented in LeRoy, when they were working with gelatin that was part of the photographic development process.